A pretty funny, often kind of dopey, yet still entertaining movie. 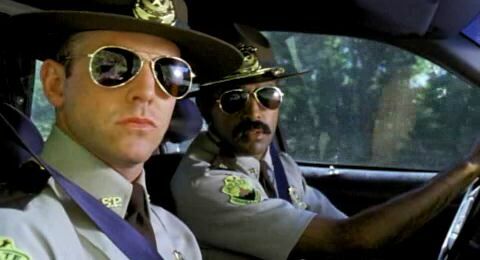 Super Troopers is a movie about goofy police men. they’re not detectives or anything, but instead, these are the guys who kind of work for the sheriff’s office. they’re the guys who go after speeders and give tickets. basically, they’re highway patrolmen, and the movie is about how they find fun ways to enjoy their job. it’s basically a series of pranks that these guys play on both each other and also on the pedestrians they come across. the idea behind the movie is funny, in fact, it was so enjoyable that they spun it into the popular tv show, reno 911. but the movie itself ends up being just okay. that’s because there really isn’t much of a plot going on. so much of the movie is devoted to pranks that after about halfway through the actual storyline of the film seems to be anybody’s guess. i’ve always believed that if a movie is funny enough, then plot doesn’t really matter, because you are enjoying the film for the laughs and that’s really enough. either Super Troopers is the movie that proves that theory wrong, or else maybe it’s just not funny enough. sure, we enjoy it, in the first half, with all of the gags put in front of us, but something definitely feels missing. some of these gags include messing around with the people they pull over. there’s a game that they play where the talking officer says the word “meow,” as many times as he can, slipping it into the conversation he’s having with the person he has just pulled over. the idea is that the person should notice, but not think that the officer is doing it on purpose. another game has one officer shadow the other one, meaning repeat everything that he says. this game is also played in front of a person who has been pulled over, and again, it is meant so that the person does not think the officers are doing it on purpose. that means that the words the first officer says are not repeated exactly, but instead are slippped in there, by the second officer, who needs to find clever ways to get them in. aside from these verbal gags, there are physical ones as well. the guys put on disguises and speed around, trying to get their fellow officers to follow them without knowing who it is they are chasing after. they also go to a restaurant and have competitions to see who can chug all of the maple syrup in a bottle the fastest. the funniest moment of that scene comes after they are finished, when someone at the restaurant actually wants some maple syrup for her pancakes and can’t get any, because the guys have just wasted it all. whatever plot there actually is in this movie probably gets started at about the halfway point. that’s when our two story elements start kicking in. they both involve the actual police detectives of the town. these are the guys who handle the serious crimes, and when a body is found in an abandoned mobile home, both the highway patrol and the police detectives show up to the scene. what ensues is a fist fight between the two teams of law enforcement, and also the first clues that there is a drug dealer working in the area. drugs are recovered from the mobile home and there is also a cartoon monkey image on them, which appears to be the calling card of this new dealer. the great brian cox is on hand here, as the boss of the highway patrolmen team, and he is the guy who gets the most frustrated when his boys come up looking like jackasses. after the fight between them and the police detectives, the newspapers run the story, making them all look like baffoons, and cox is furious about it. he’s so great in roles like this, playing the tough guy father figure who has no patience for stupidity. we’ve seen him play this kind of role before both in serious ways (the 25th hour, adaptation), and in comedic ways (the campaign). but this movie offers something more, when it gives us a scene of cox cutting back himself, hanging out and getting drunk with the guys before going out on the town to have some fun messing with people the same way they do.